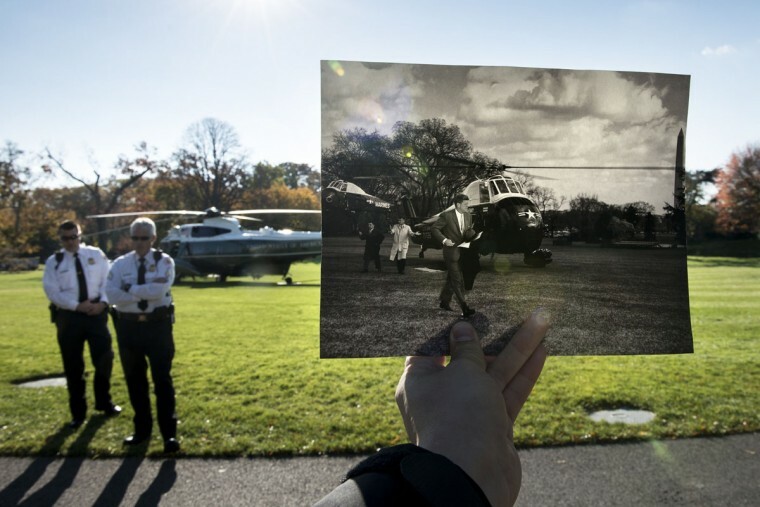 A historic photo (Robert Knudsen, White House Photographs, John F. Kennedy Presidential Library and Museum, Boston) showing former US President John F. Kennedy walking from transport helicopters is held up near its original location with a modern Marine One sitting in the background on the South Lawn of the White House November 8, 2013 in Washington, DC. The archive photo depicts Kennedy walking from both Army and Marine helicopters. At the time, both services shared responsibility for the US President’s helicopter travels. 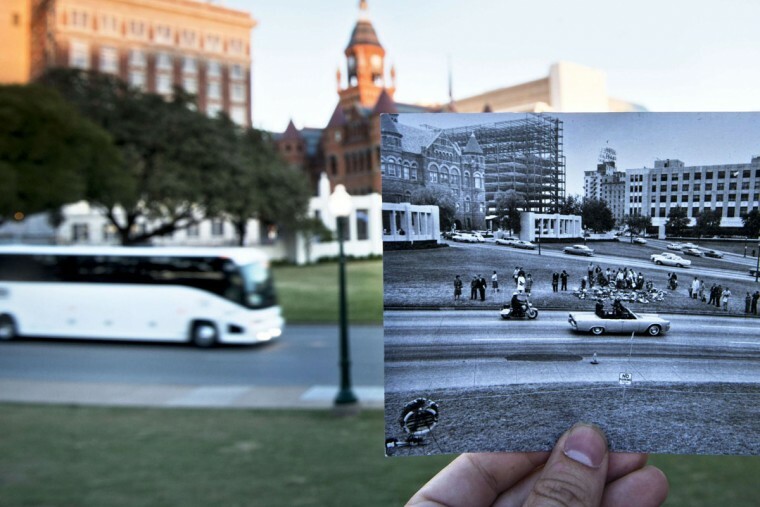 November 22, 2013 marks the 50th anniversary of President John F. Kennedy’s assassination in Dallas, Texas. A historic photo dated June 15, 1961 (Robert Knudsen, White House Photographs, John F. Kennedy Presidential Library and Museum, Boston) is displayed in the driveway near the White House in Washington, DC November 8, 2013. The archive photo shows former US President John F. Kennedy’s X-100 limousine during a demonstration. The X-100 limo, based on the 1961 Lincoln Continental 4-door convertible, featured interchangeable tops and a hydraulic seat to elevate the president. When President Kennedy was assassinated November 22, 1963 he was riding in the limo without its top while passing though Dealey Plaza in Dallas, Texas. November 22, 2013 marks the 50th anniversary of President John F. Kennedy’s assassination. A historic photo dated June 4, 1963 (Cecil Stoughton, White House Photographs, John F. Kennedy Presidential Library and Museum, Boston) is held up near its original location on the Southlawn of the White House in Washington, DC November 13, 2013. 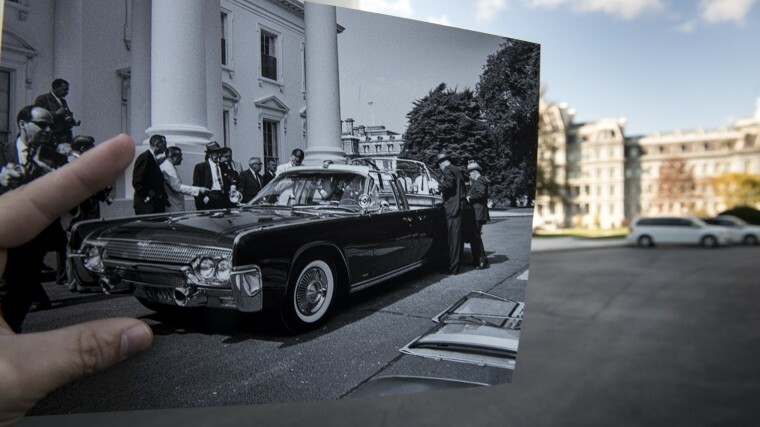 The archive photo shows India’s President Sarvepalli Radhakrishnan with US President John F. Kennedy in his X-100 limousine juxtaposed with the current-day armored presidential motorcade in the background left. 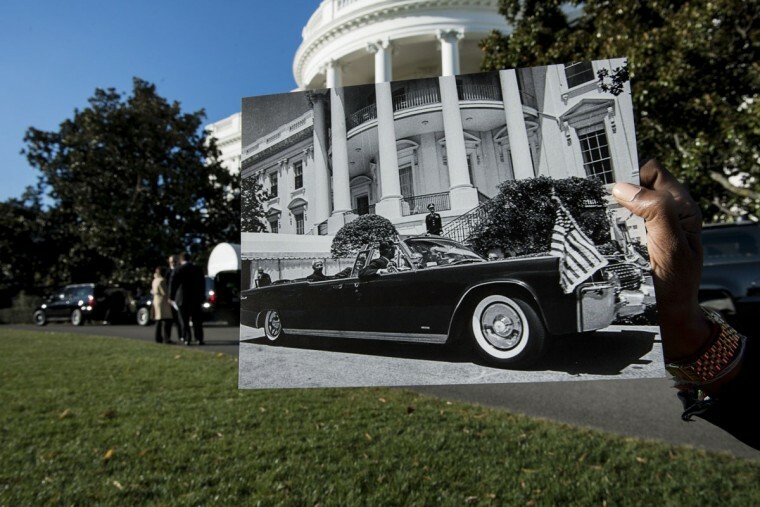 The X-100 limo, based on the 1961 Lincoln Continental 4-door convertible, featured interchangeable tops and a hydraulic seat to elevate the president. When President Kennedy was assassinated November 22, 1963 he was riding in the limo without its top while passing though Dealey Plaza in Dallas, Texas. November 22, 2013 marks the 50th anniversary of President John F. Kennedy’s assassination. 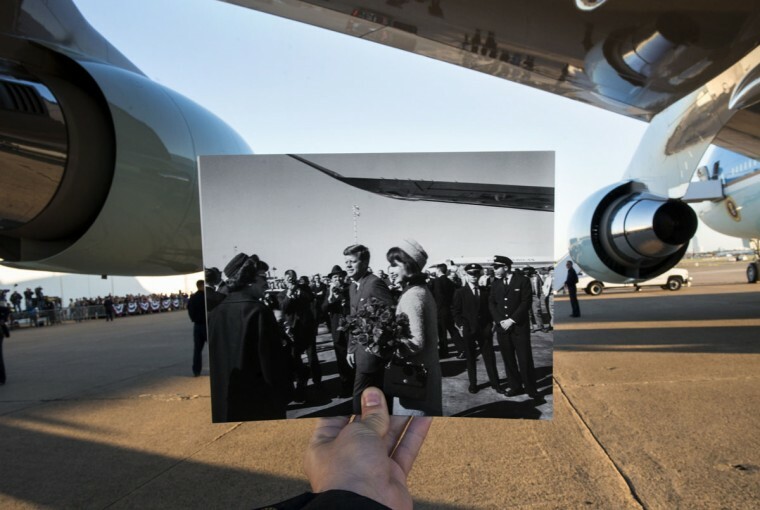 A historic photo dated November 22, 1963 showing former US President John F. Kennedy and First Lady Jacqueline Kennedy arriving in Dallas, Texas (Cecil Stoughton, White House Photographs, John F. Kennedy Presidential Library and Museum, Boston) is held up by the photographer against Air Force One in the background as US President Barack Obama arrives at Love Field November 6, 2013 in Dallas, Texas. 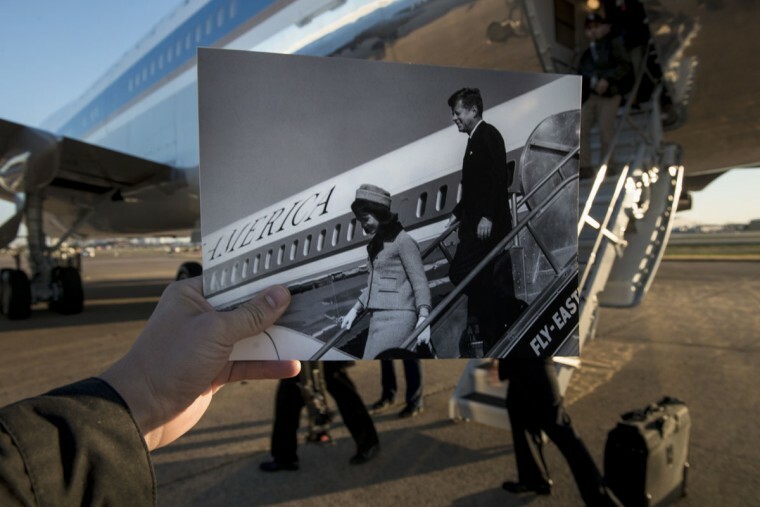 The archive photo depicts the Kennedy’s as they walk off an Air Force One based on the Boeing 707 as the modern Air Force One (seen in the current photograph) is based on the 747. November 22, 2013 marks the 50th anniversary of President John F. Kennedy’s assassination in Dallas, Texas. A historic photo dated November 22, 1963 showing former US President John F. Kennedy and First Lady Jacqueline Kennedy arriving in Dallas, Texas (Cecil Stoughton, White House Photographs, John F. Kennedy Presidential Library and Museum, Boston) is held up by the photographer against Air Force One in the background as US President Barack Obama arrives at Love Field November 6, 2013 in Dallas, Texas. The archive photo depicts the Kennedy’s after they got off an Air Force One based on the Boeing 707 while the modern 747-style Air Force One’s wing and engines can be seen in the current photograph. November 22, 2013 marks the 50th anniversary of President John F. Kennedy’s assassination in Dallas, Texas. 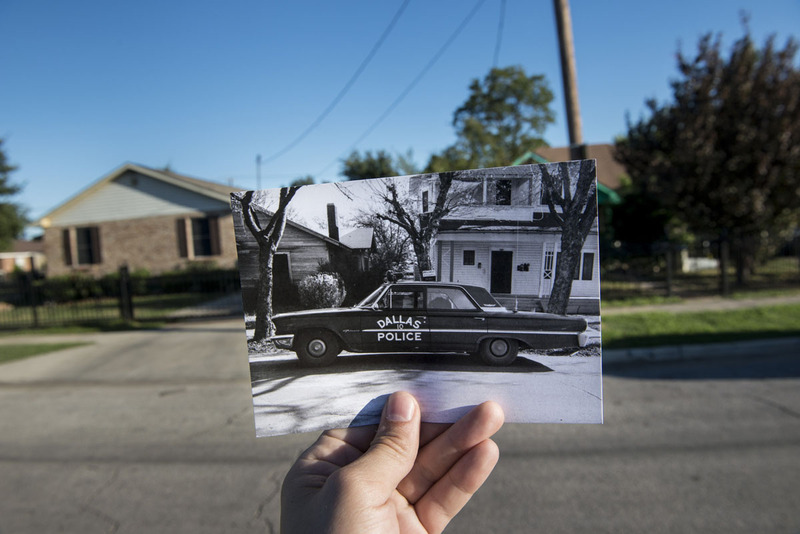 A historic photo dated November 22, 1963 (Cecil Stoughton, White House Photographs, John F. Kennedy Presidential Library and Museum, Boston) is held up by the photographer and juxtaposed with the original scene October 10, 2013 in Dallas, Texas. The White House photo depicts the Newman family on the ground after former US President John F. Kennedy was shot in Dallas’s Dealey Plazza, Texas. November 22, 2013 marks the 50th anniversary of President John F. Kennedy’s assassination. 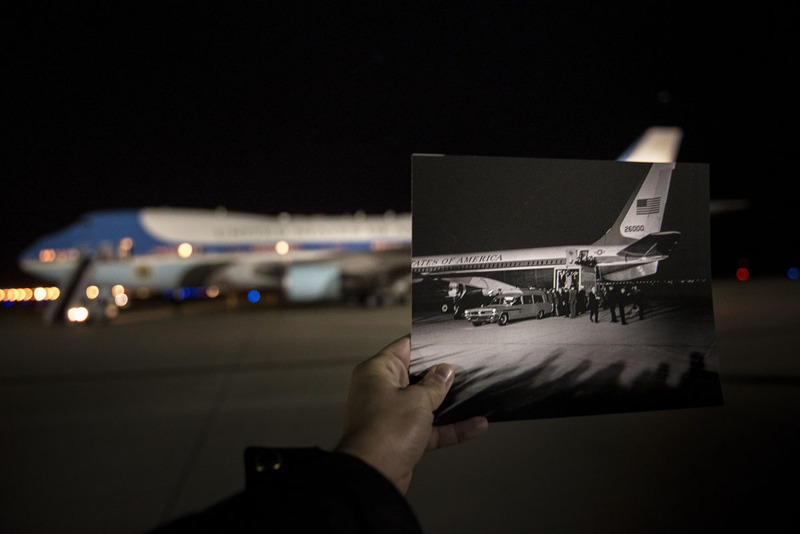 A historic photo dated November 22, 1963 (Cecil Stoughton, White House Photographs, John F. Kennedy Presidential Library and Museum, Boston) is held up by the photographer as Air Force One sits on the tarmac at Andrews Air Force Base, Maryland, November 6, 2013. The archive photo depicts President John F. Kennedy’s remains being returned from Dallas, Texas and unloaded from Air Force One into a Navy Ambulance. November 22, 2013 marks the 50th anniversary of President John F. Kennedy’s assassination. 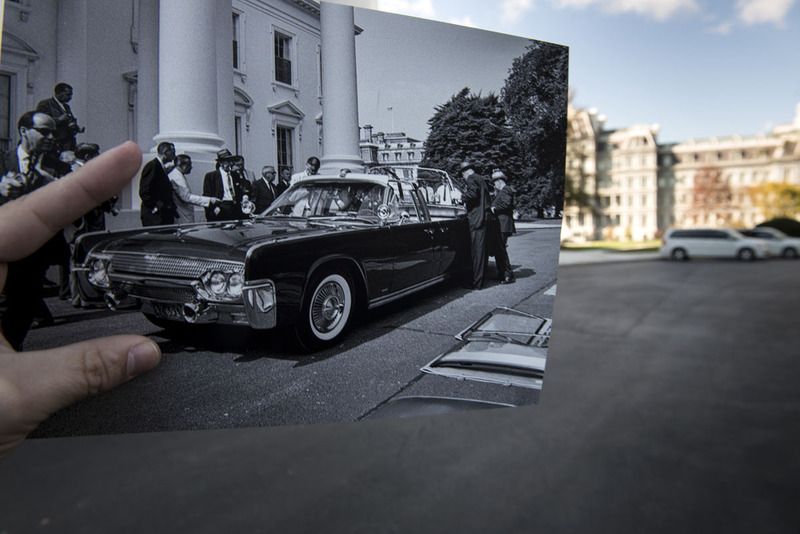 A historic photo dated November 23, 1963 (Abbie Rowe, White House Photographs, John F. Kennedy Presidential Library and Museum, Boston) is held up by the photographer near its original location in the Cross Hall of the White House November 8, 2013 in Washington, DC. 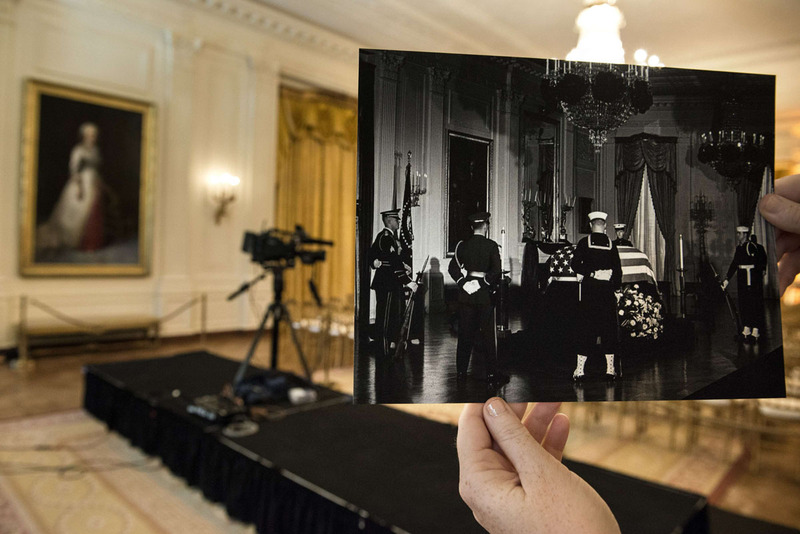 The archive photo shows President John F. Kennedy’s casket as it lies in state in the East Room of the White House attended by two members of the honor guard. November 22, 2013 marks the 50th anniversary of President John F. Kennedy’s assassination in Dallas, Texas. 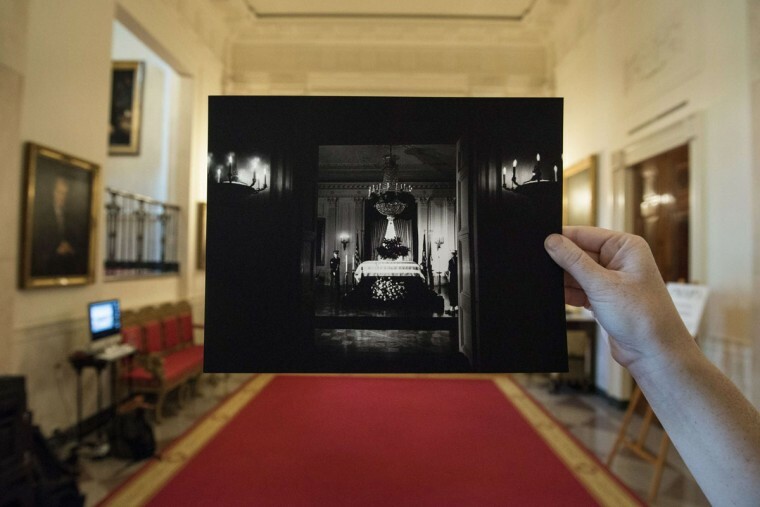 A historic photo dated November 23, 1963 (Robert Knudsen, White House Photographs, John F. Kennedy Presidential Library and Museum, Boston) is displayed near its original location in the Cross Hall of the White House November 8, 2013 in Washington, DC. The archive photo shows President John F. Kennedy’s casket as it lies in state in the East Room of the White House attended by an honor guard. November 22, 2013 marks the 50th anniversary of President John F. Kennedy’s assassination in Dallas, Texas. 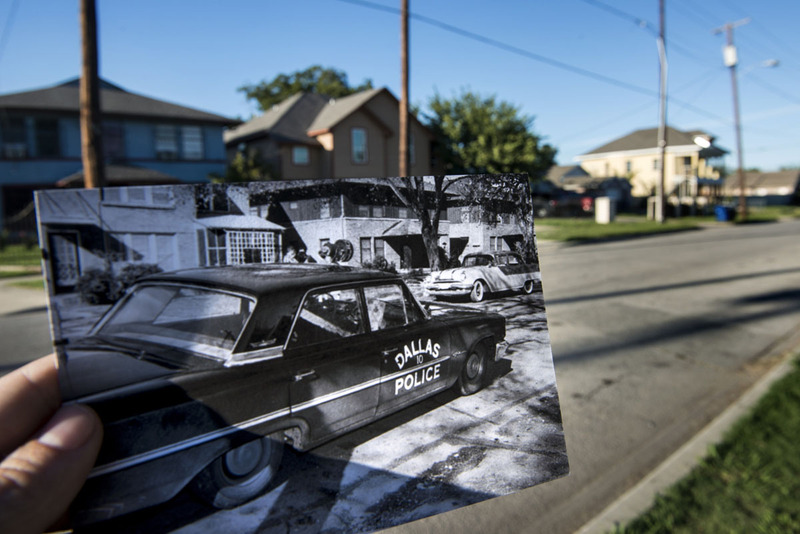 A historic photo of post JFK assassination Dealey Plazza (Dallas Police Department, Dallas Municipal Archives, City of Dallas, Texas) is displayed near its original location in Dallas, Texas October 7, 2013. The archive photo depicts investigators reconstructing the assassination of former US President John F. Kennedy near where he received a fatal rifle shot to the head. November 22, 2013 marks the 50th anniversary of President John F. Kennedy’s assassination. A historic photo of post JFK assassination shows the Texas School Book Depository building (Dallas Police Department, Dallas Municipal Archives, City of Dallas, Texas) displayed near its original location in modern day Dealey Plazza in Dallas, Texas October 8, 2013. The archive photo was used in testimony before the Warren Commission and has been marked to show where a witness saw a man with a rifle and onlookers. November 22, 2013 marks the 50th anniversary of President John F. Kennedy’s assassination. 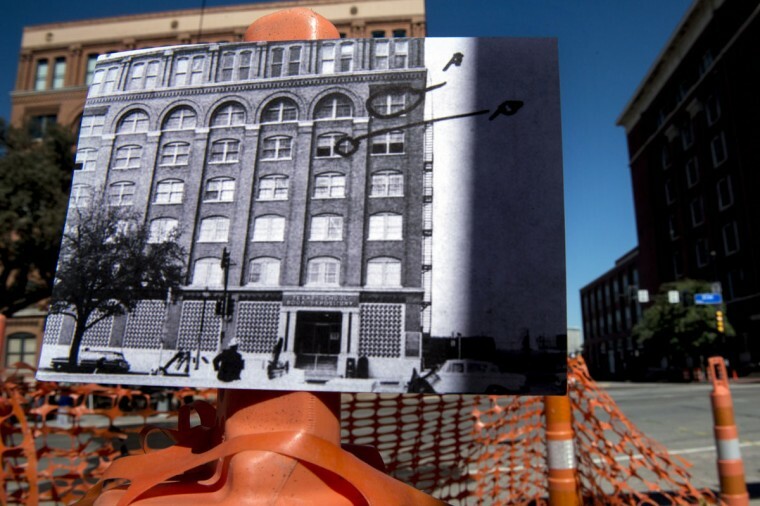 A 1964 historic federal law enforcement photo of the post JFK assassination shows FBI agent Robert Frazier reenacting the JFK assassination near its original location at the Texas School Book Depository building in Dallas, Texas October 8, 2013. November 22, 2013 marks the 50th anniversary of President John F. Kennedy’s assassination. 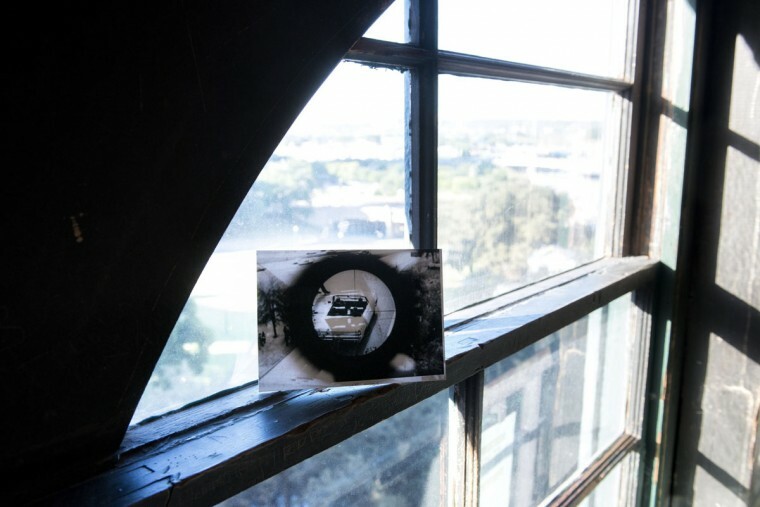 A 1964 historic federal law enforcement photo showing a Secret Service car turning from Main Street to South Houston Street in Dallas, Texas during post JFK assassination investigations sits near its approximate angle on the 6th floor at the Texas School Book Depository building in Dallas, Texas October 8, 2013. The photo from Federal law enforcement depicts rifle views during an official reconstruction of the assassination of former US President John F. Kennedy. November 22, 2013 marks the 50th anniversary of President John F. Kennedy’s assassination. A historic federal law enforcement photo showing a Secret Service car on Elm Street in Dallas, Texas during post JFK assassination investigations is seen from its approximate angle on the 6th floor at the Texas School Book Depository building in Dallas, Texas October 8, 2013. 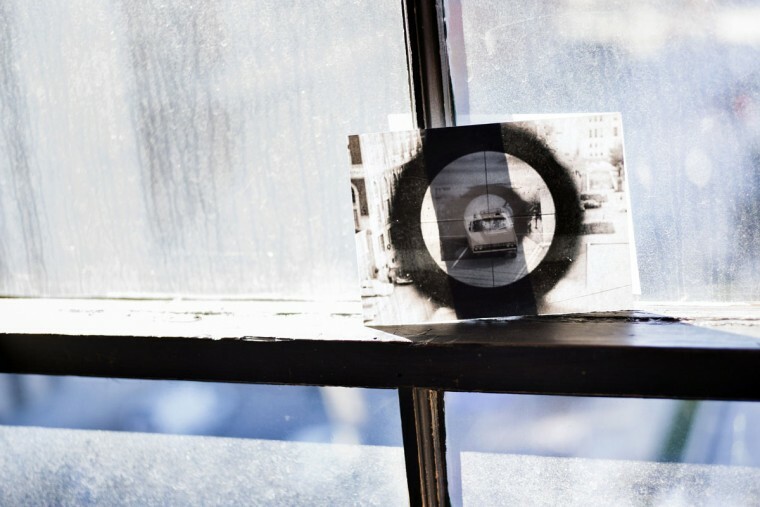 The photo from government investigators depicts rifle views during an official reconstruction of the assassination of former US President John F. Kennedy. November 22, 2013 marks the 50th anniversary of President John F. Kennedy’s assassination. 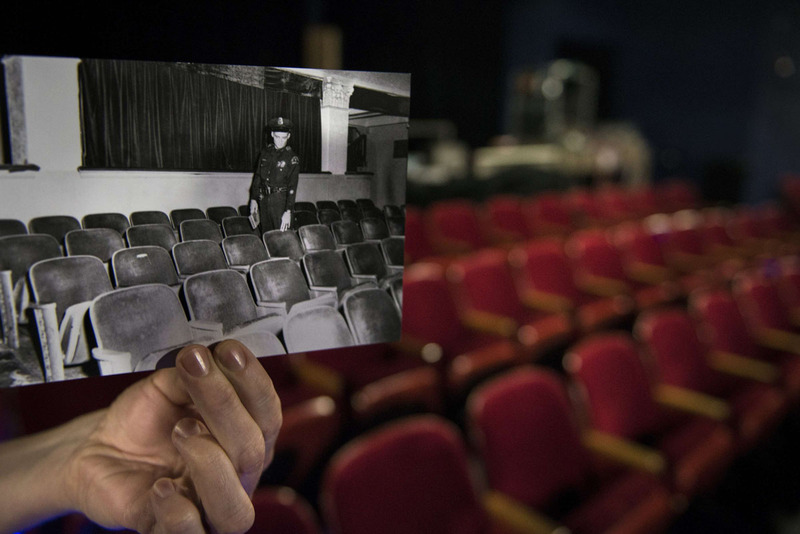 A 1963 historic photo showing a Dallas police officer inside the Texas Theater (Dallas Police Department, Dallas Municipal Archives, City of Dallas, Texas) is seen inside the original location in Dallas, Texas October 8, 2013. 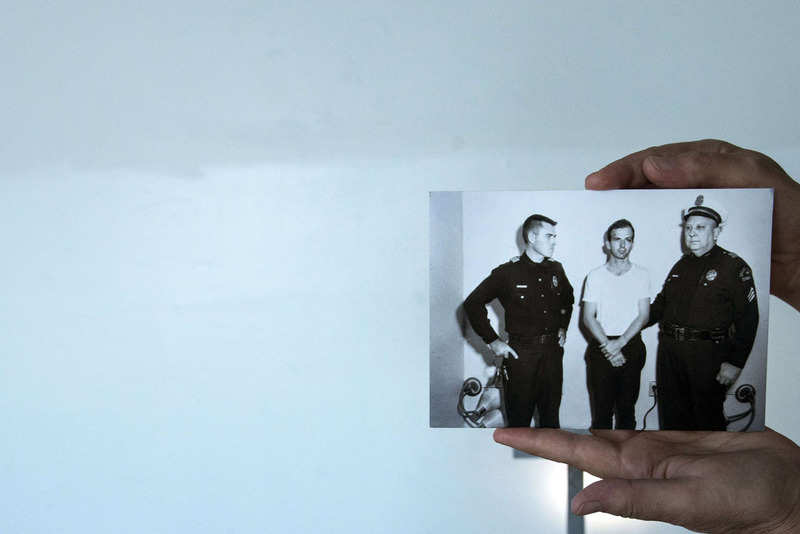 The archive photo shows the officer pointing to one seat where Lee Harvey Oswald, the alleged assassin of former US President John F. Kennedy, was spotted sitting. November 22, 2013 marks the 50th anniversary of President John F. Kennedy’s assassination. A 1963 historic photo showing Dallas Police Officer J. D. Tippit’s car (Dallas Police Department, Dallas Municipal Archives, City of Dallas, Texas) is seen October 8, 2013 near where it was originally taken on East 10th Street in Dallas, Texas. 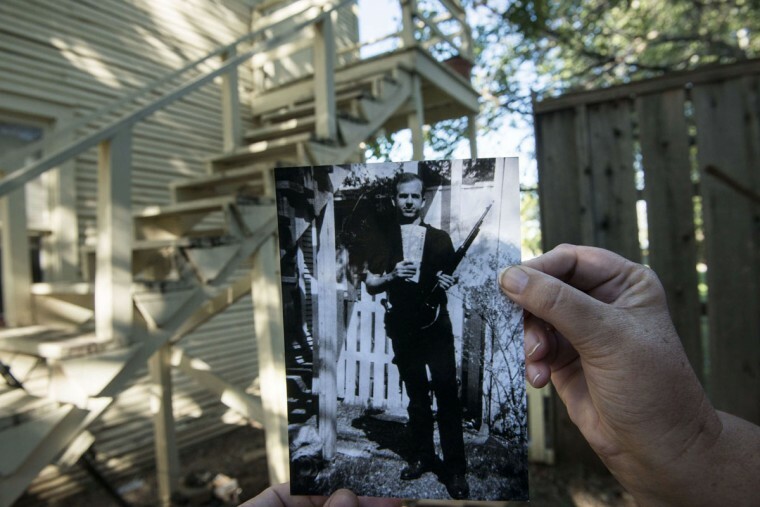 Officer Tippit was shot by Lee Harvey Oswald, the alleged assassin of former US President John F. Kennedy. November 22, 2013 marks the 50th anniversary of President John F. Kennedy’s assassination. An undated historic photo shows Lee Harvey Oswald (Dallas Police Department, Dallas Municipal Archives, City of Dallas, Texas) in its approximate modern day location behind a home on West Neely Street in Dallas, Texas October 9, 2013. 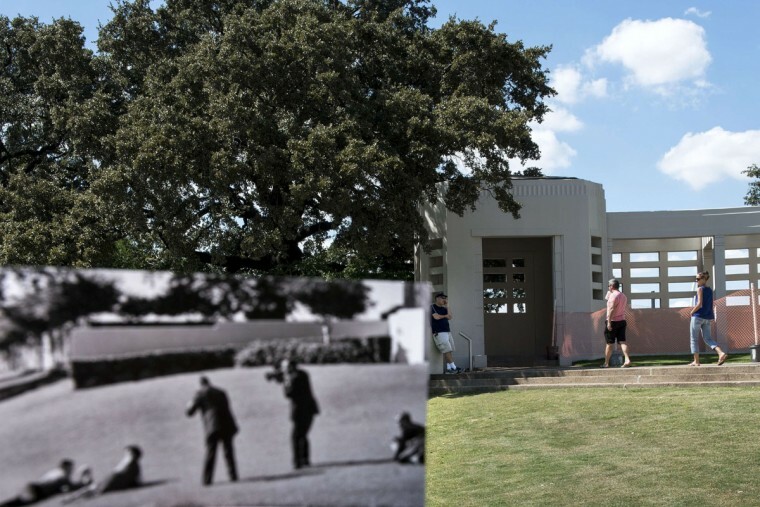 The photo, which once appeared on the cover of Life, allegedly taken by Marina Oswald, and depicting the alleged assassin of former President john F. Kennedy with a rifle and communist newspapers, has been a point of controversy many claiming it was a fake. November 22, 2013 marks the 50th anniversary of President John F. Kennedy’s assassination. 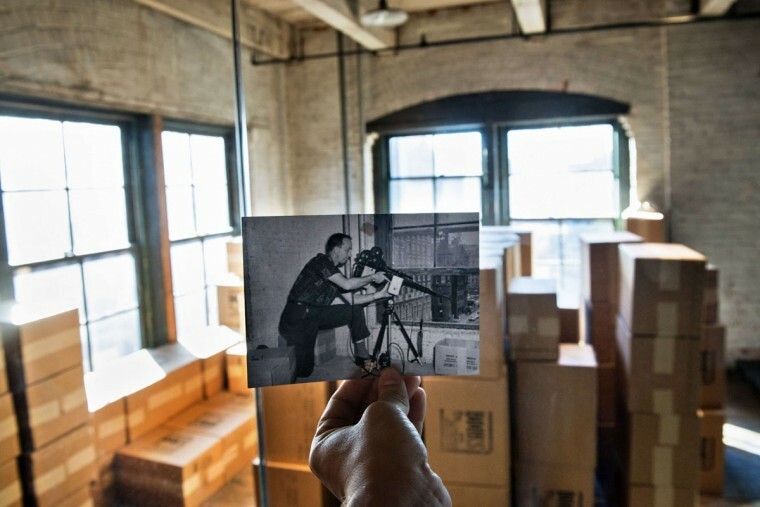 A 1964 historic photo shows Lee Harvey Oswald (Dallas Police Department, Dallas Municipal Archives, City of Dallas, Texas) in its approximate modern day location in the old Dallas police headquarters, Texas October 8, 2013. The archive depicts alleged JFK assassin Lee Harvey Oswald being held by police after processing. November 22, 2013 marks the 50th anniversary of President John F. Kennedy’s assassination.